I know a few designers and audio engineers to whom the power cord phenomenon is a highly unpleasant obnoxicant. Power cords shouldn't make the kind of audible differences they can make. It's something even these science-driven types will grudgingly admit. As part of their work, they must rely on and trust their own ears to incorporate empirical evidence that lacks any obvious textbook verification or convenient explanation. They acknowledge full well that power cords will sound different from one another. But they usually prefer to derail the conversation to a topic over which they have a firmer grasp. ZCable's top cords would really irritate these folks. They're very expensive because of complex hand-built layering of RFI/EMI repellent/absorbent substructures. They're somewhat stiff and rather thick because of it. And they truly make a difference. I can't claim in-depth familiarity with the latest heavy-weight champs in this arena - I haven't heard Shunyata's current top crop nor Dave Elrod's super snakes. My bench marks have been Audio Magic's Clairvoyants and HMS's best prior to that firm's recent introduction of the Gran Finale power cords which I haven't heard yet. When I use the term 'bench marks', it's for no reason other than that these products worked best in my personal scenario based on what's come through over the years. This included cords by Harmonic Technology, BPT, Mapleshade and Furutech. The following comments are thus based on somewhat limited experience. That said, the ZCable cords improved over my prior contenders in a couple of areas, specifically bass weight and slam; enhanced image density or body; micro-dynamic range; and a further reduction of my system's noisefloor which I didn't think possible since I live in a remote rural area and partially underground, two factors that put me at the polar opposite end of inner city dwellers who, among other factors, are exposed to multiple high-power broadcast antennas and a much greater density of cellphone, computer and grid usage. Even so, my idyllic isolation from the big bad world of power pollution still proved itself prone to small-scale interferences, something only their present removal pointed out. If you've ever heard what a good tube amp will introduce when replacing a transistor unit; or have noted the thermal stabilization process from initial system power-up to however much time is required until everything locks into place and sounds right - then you can immediately appreciate the types of gains in fullness, dimensionality and life I experienced with these power cables. Additionally, the tube example should point at a very specific glowing smoothness -- sometimes called saturation -- which, don't bother asking why or how since I wouldn't know, the ZCable wires imparted as well. If you consider that power cords don't transmit a complex musical signal but rather a 60-cycle sine wave and its harmonics, hyper-fast ultra-high frequency power-supply-induced pulses and whatever ultrasonic garbage gets dumped into the line from your own household and audio/video appliances as well as neighbors to ride like freeloaders on this sine wave - then in particular these tonal saturation gains from swapping out power cords make very little sense. That enhanced conductor mass can equal higher current-carrying capabilities seems sensible. Ditto for associated audible gains in bass performance and dynamic swings. That suppression of airborne and AC-line noise components would lower system noisefloor, enhance micro detail and remove glare, grit and harshness seems reasonable as well. When it comes to a notable dose of thermionic image density though, I must confess to not understanding what's going on. But as a subjective audio reviewer, I can get away with reporting solely on my listening impressions. Our despicable kind leaves fancy explanations to others who are better equipped to dotting the electrical 'eyes' and crossing the engineers' tees'. Now you can appreciate why this whole subjective reviewing business is regarded with little more than annoyance or even hostility in certain quarters. As a highly satisfied owner of both BPT's BP-3.5 Signature and Lloyd Walker's Velocitor conditioners [the former on the preamp, power amp and subwoofer modules, the latter on the digital source components], I've come to regard the line feed from the wall as the most critical power cord juncture. Put differently, my personal religion's power delivery commandment orders ye to put your best cord between wall and conditioner. Mark Hampton of ZCable had sent three Cyclones, one with a 20-amp Hubbell to fit my balanced power conditioner. After the Velocitor, the final spare was alternately put on my Zanden DAC or the Bel Canto PRe6. The 6 Hurricanes went on everything else. This power cord game is clearly both wickedly additive and exhaustively subtractive - additive because performance continues to improve as you better the interface between components and the AC source; and subtractive because your pocket book will take some serious hits along the way. At what point the improvements diminish in significance vis-a-vis expenditure will depend on your system and personal finances. But don't mistake expense for outright frivolity. The potential forward momentum in system performance is anything if not desirable and can, especially in that critical juncture between wall and main power delivery component, be unexpectedly drastic. The right image above shows the difference in girth between the Cyclone and Chris Hoff's BPT cord as shipped with his best balanced isolator. Why a cord preceding a high-precision isolation transformer would make this much of a difference is something I'm not equipped to answer except to state that the improvements in the areas already noted began when this juncture was exchanged and continued with each additional cord. It's difficult to quantify at what point progress slowed down, or which step beyond the biggest first one was the next most significant one. To my ears, the DAC seemed the one to benefit most once the conditioner feeding it had been 'z'd'. 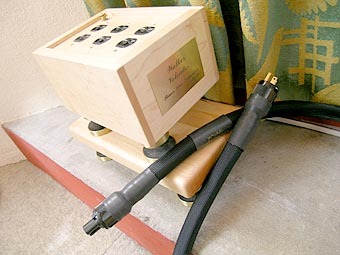 While certain power cord designs I've tried -- the Mapleshade comes to mind -- inject speed and transient incisiveness, the ZCable recipe tended towards warmth without sluggishness, as though one took the 'good' elements of prototypical valves and passed on their 'bad' ones. I've said a similar thing about ZCable's signal cables and perhaps that's because this type of sound is what their designer aims for. It's not a hyped or bloated sound but one that's relaxed, resolved, dynamic and organic. While I perhaps was prepared for lowered noise floor and the concomitant increase of low-level visibility, I must confess that I didn't at all expect this tonal texture. This difference was somewhat parallel to switching from the Bel Canto eVo 4 to my Audiopax monos - while the valves reveal a different harmonic content, they also imbue the music with a changed feel. And while this general area reeks of mysticism, wishful thinking and all manner of hyperbolic language, folks who are familiar with this effect will know what I'm trying to describe - a different sense of vibrant space around and between performers, like tangible auras that extend into three dimensions. Some reviewers refer to it as glow as though to describe the action of material emanations. While fitting in a subtle way, the word 'glow' lends itself to be mistaken for a golden/orange color especially in relation to the visible radiation of tubes; and that's not what I'm referring to here. Instead, it's more along the lines of a greater plasticity which communicates itself as enhanced physicality and dimensionality, i.e. not so much a tonal as spatial effect. Whatever words you would chose to describe it, I'm confident you'd hear the same thing. Call it some form of Carver-esque aural holography. Putting more ZCables into the system strengthened this effect perhaps because it removed more and more subtle dampers restricting this expansion before. But the general tenor of this change set in with the first cord replacing my customary BPT cord with integral Z-Sleeve and merely grew more pronounced. Hence it's the overriding quality I've concentrated on describing here. In closing, applying the tired old but diehard logic of placing constituent parts on one's garage floor to compare those same parts against, say what's inside the BPT 10-outlet conditioner with its massive Plitron transformer and heavy-duty casework, my only 'problem' with today's ZCable power cords/conditioners is their relatively high price. But perform the same exercise with a $20,000 amp or speaker and compare their parts count against that of an equivalently priced new car. Somehow, fitting this type of thinking to our HighEnd cottage industry with its one-up hand labor and extensive preceding trial'n'error R&D phase doesn't seem to work. When I envision our designer laboring away in his lab, fitting the complex layers of Z-Sleeve technology around the actual conductors in widening concentric tubes, I'm seeing a clock tick away. That clock started ticking a long time ago when he began figuring out how to do this, what to affix where in what quantity and made out of what exact material. And that's where the price begins to enter the picture. It makes perfect sense. And, the associated performance is a home run that proved repeatable on tube, digital and traditional Class A amps as well as all the other components that make up my system. And yes, only a few stout souls with the requisite resources will be able to outfit an entire system to duplicate what I was lucky enough to experience during my review loan period. But make no mistake - I'm truly sorry to see these black things slither back home from whence they came. For those like me with limited budgets who use some kind of power delivery or outlet multiplier device, I strongly recommend that you at least consider addressing that first tap between the system and your local power utility with the best connection interface possible. If that kind of thinking makes sound sense to you, your shortlist of contenders would have to include both the ZCable Cyclone Ref1 or Hurricane Ref1. Of course once you hear what they do there, you might become curious about what would happen if you stuck one of them on your power amp or source component. You could well become addicted then - but I'm quite certain that Mark Hampton wouldn't mind one bit. Neither would your system nor anyone listening to it. And if you were to tell me that you're the only one who's doing much of it, I'd merely add that you might not just want to change your power cords but change that sorry state of affairs, too. Cheers.